Take a look at the programs we offer to help homeowners in need. The Community Block Build takes a house-by-house approach to improving the health and well being of low-income households in a focused area of high need. Volunteers from the community and the professional trades donate their time to help homeowners in need of critical home repairs. Together, we complete handicap accessibility modifications, plumbing/electrical work, energy efficiency upgrades, landscaping and painting to transform a neighborhood. It's a major rebuilding blitz culminating on National Rebuilding Day on Saturday. The Safe At Home Program provides a unique and necessary service for Aurora seniors and persons with disabilities to improve access throughout their home and reduce the risk of falls and in-home injuries. We provide opportunities throughout the year for organizations and groups to schedule a unique volunteer experience serving seniors, veterans, children and persons with disabilities. 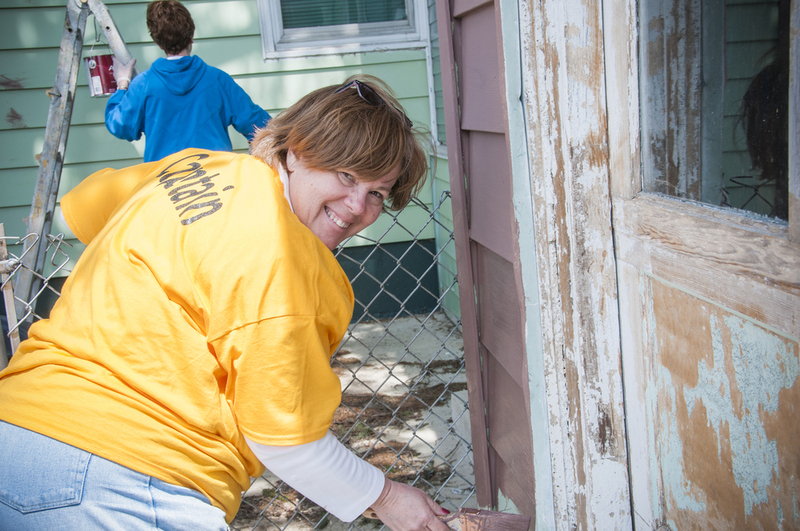 Consider planning a corporate event with Rebuilding Together Aurora. Submit you group interest form today to get your group involved in your own special day of service.